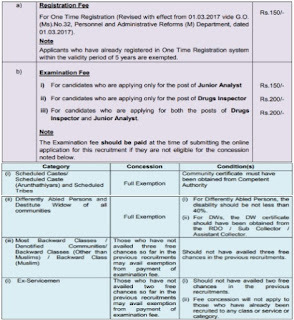 TNPSC (Tamil Nadu Public Service Commission) Has Released Recruitment Notification For 49 Drugs Inspector, Junior Analyst Posts. All Eligible And Interested Candidates Can Apply Online On Or Before 12-05-2019 (12th May 2019). 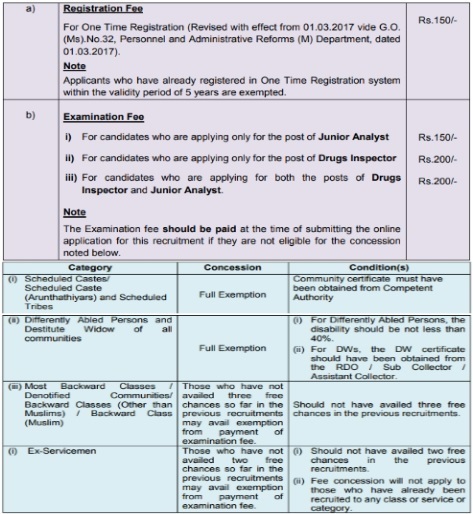 Further Detailed Information Regarding Educational Qualifications, Age Limit, Selection Procedure, Exam Pattern, Syllabus for TNPSC (Tamil Nadu Public Service Commission) Recruitment 2019 - 49 Drugs Inspector, Junior Analyst Post is mentioned below. Age Limit - Candidates age should be between 18 to 30 Years As on 01-07-2019. Pay Scale - Rs. 37,700 - 1,19,500/- (Post 1), Rs. 36,400 - 1,15,700/- (Post 2) Per Month . How To Apply - All Eligible and Interested candidates may fill the online application through official website http://www.tnpsc.gov.in before or on 12th May 2019. Last Date To Submit Online Application : 12-05-2019. Click Here For TNPSC Recruitment 2019 Detailed Advertisement.